I’ve raised poultry for the past 8 years; chickens, roosters, guinea hens and ducks. These birds are my family, and I love them dearly! As any bird lover will tell you, a home is just a house without a bird! 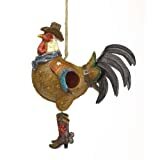 If you have someone on your gift list that adores roosters, here are some unique gifts that will brighten their lives and bring a smile to their face each time they see them. While many people think roosters only strut around and make a lot of noise, they can actually be lovable pets! Like other birds, a rooster has a distinctive personality, and can make many sounds. Most will follow you around just like a puppy, eat tasty morsels from your fingers, and ride around on your shoulder. They love to be cuddled, and will stick their head beneath your arm to take a nap. When my favorite rooster, Pete, was young, he'd sit in my recliner and nap while I watched television. He’s gotten a bit big and wiggly now, and prefers to strut around the yard than hang out with me. When I see whimsical roosters, I think of him. I’ve always enjoyed bird houses of different styles and colors, and have several around my yard. No only do I house my poultry, but also a variety of wild birds. I particularly like this Cowboy rooster bird house. It would be a great addition to an existing chicken yard. The rooster is decked out in his finest Western clothes, ready to strut his stuff! No chicken yard of your own? Hang it from a tree limb or on your porch, and he’ll bring a smile each time you see him. Roosters come in a variety of colors and sizes. Three of my roosters are red. The oldest is Rojo, who is a Rhode Island Red. His sons are Pete and Pat. I also have a huge white rooster named Big Foot, and two multi-colored ones: Elliott and Buddy. They are mainly white, with black, brown, gold and red feathers throughout. Such beautiful birds! If you have a rooster lover on your gift list, who also loves wine, this is a unique gift for both! 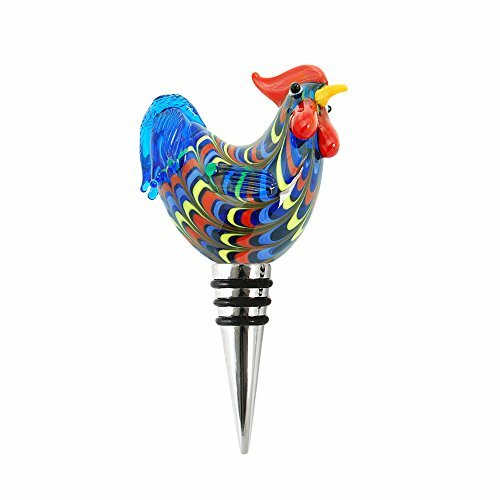 A multicolored rooster sits at the top of the bottle stopper, bringing color and whimsy to any home. 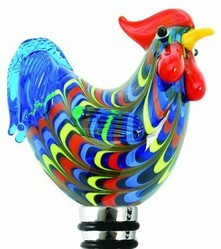 The rooster’s body is made of glass, while the base is metal with 3 rubber rings. The stopper will fit securely on most wine bottles, ensuring your beverage stays fresh much longer. Add some color to any room with this unique rooster fan! It cools the room like any other fan, but also adds some cheeriness and beauty. It’s small size – just 15 inches across – won’t take up much room, and it uses only 30 watts of electricity. A rooster does so much more than crow! He also takes care of the hens. If he finds a tasty morsel on the ground, he’ll call them over. If a predator flies over, he’ll signal them to run and hide. If you need a practical gift for a rooster lover, here are presents they are sure to love! 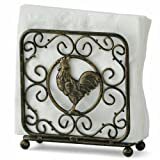 Add a rooster to your table with this napkin holder from the Paula Deen collection. It holds the larger napkins, as well as the smaller, everyday size. It is the perfect addition for the dinner or party table. 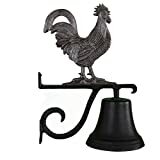 Install this cast aluminum dinner bell outside your door and like a rooster, you can call the family to dinner! At just 12 inches long and 9 inches wide, it will fit just about any porch pole or roof eave. A pretty and useful decoration for your home and patio! Let this rooster show you which way the wind blows. Place it on top of your roof, and he’ll keep track of the winds, all the while watching over your house. Made of steel with a baked-on finish, this weather vane will hold up to high winds and stormy weather. Stainless steel ball bearings are sealed inside the wind cups, allowing for easy movement. And the best part of this weather vane? It’s made by a small family business, based in the USA! A wonderful book that instructs poultry owners on how to take care of their chickens. From food and housing, to medications and surgery, every chicken owner needs a copy of The Chicken Health Handbook. Do you have a rooster lover on your gift list? Please let me know how you like these gift suggestions for people who like roosters, or if you have any other ideas for rooster lovers. How to upcycle and recycle items from junk laying around your house. This magazine will entertain you, and make you think "I wish I had thought of that!"